Last week, in what will prove to be good news for private landowners, Occidental Petroleum Corporation (Oxy) announced that it has committed $12 million to enroll nearly 1.8 million acres of its interests in Texas, New Mexico, Kansas and Oklahoma, in conservation programs to support the recovery of the lesser prairie chicken (LPC), which is currently a candidate species for a threatened or endangered listing under the Endangered Species Act (ESA). A decision on that listing is due later this month. The lesser prairie chicken is a species of grouse in the southern Great Plains states of Colorado, Kansas, New Mexico, Oklahoma and Texas. Habitat loss and fragmentation due to human activity, as well as persistent drought have contributed to drastic LPC population declines. The grouse’s population has declined to an estimated 17,615 individuals, and the species currently inhabits only 17% of its historic range. H owever, a diverse coalition, including state wildlife agencies, the energy industry, conservation interests and private landowners has formed to develop innovative conservation strategies recover the LPC. Oxy, an oil and gas exploration and production company with operations in the southern Great Plains, was one of the first members of the energy industry to enroll in the Lesser Prairie Chicken Range-wide Conservation Plan (RWP) developed by the Western Association of Fish & Wildlife Agencies (WAFWA), which has been endorsed by the U.S. Fish and Wildlife Service (USFWS). A leader for LPC conservation within the oil and gas industry, Oxy has committed $12 million over a three-year period to fund species recovery efforts for private landowners who need financial assistance with their own conservation efforts through the Range-wide Plan, in addition to the 1.8 million acres of its own land enrolled in conservation programs. Many other companies are also enrolling acreage to support lesser prairie chicken conservation. Enrollment in the RWP by Oxy and other companies will provide them certainty in the uncertain world of Endangered Species Act rules and regulations. Not knowing if the LPC will be listed as a threatened species under the ESA, and what specific regulations they could face in the event of a listing, had made it difficult for Oxy, and others in the industry, to plan ahead. Fortunately, WAFWA, in partnership with the U.S. 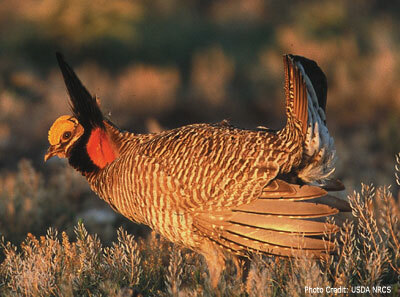 Fish & Wildlife Service (USFWS), created a Range-wide Oil and Gas Candidate Conservation Agreement with Assurances for the Lesser Prairie Chicken, also known as oil and gas CCAAs. Like traditional CCAAs, the oil and gas CCAA is a voluntary program in which an oil and gas company agrees to conduct conservation measures for recovery of a species, in this case the LPC, that is a candidate for threatened or endangered status under the ESA. In return, the company receives an Enhancement of Survival Permit and assurance from the USFWS that, so long as it continues to comply with the terms of the CCAA, the company will not be subject to any additional regulations should the species be listed. These companies believe the RWP is a workable plan; workable for the species and for the companies and private landowners who have LPC habitat on their land. Here, it is important to note that the RWP is not itself a specific conservation program, but a plan that encompasses multiple conservation programs, like the oil and gas CCAA. The plan enables WAFWA to take the money paid into the plan by companies and, through agreements with private landowners, create new or improved habitat for the species. Leaving state wildlife agencies in the LPC range (Colorado, Kansas, New Mexico, Oklahoma and Texas) in charge of the species' conservation cannot be overstated. States have several advantages over the federal government agencies. Most importantly, they know the territory; they know the people and the wildlife better than anyone else. It's also important for private landowners, who can be suspicious of federal intrusion on their land, to know that their state representatives and wildlife officials are there to help them conserve habitat for conservation. However, while the support of state and federal agencies has been, and will continue to be, important for wildlife conservation, public funding for conservation has been greatly diminished in recent years as governments try to balance their budgets. This gap in funding makes the influx of private capital from companies like Oxy more important to conservation than ever. For our part, LandCAN recently created the Habitat Conservation Assistance Network (HabitatCAN), a website designed to help private landowners conserve habitat for species which are candidates for listing under the ESA, or are already considered threatened or endangered by providing information in the species, the conservation measures needed to restore and conserve their habitats, and the professionals, organizations, and programs that can provide financial and technical assistance to implement the desired conservation practices. The lesser prairie chicken is the first species to be featured on the site, with more to come in the future. Thanks Amos, there are a lot of people in New Mexico that have been working with the LPC for a long time and doing a lot of really good work. It just seems that these efforts are quickly forgotten. I want to make sure that their hard work, which laid the groundwork for the New Mexico CCA/CCAA and the RWP, are not overlooked. Without the hard work of these people and their efforts on the ground, these programs would not have gone anywhere. Matt, good questions, I'll try to answer them in order. 1: The RWP is very new. The final draft came out in January. 2: I'm not sure how much money has been committed to the New Mexico CCA/CCAAs, but about 1.3 million acres of oil & gas interests, including some of Oxy's, have been enrolled there. 3: Yes, RWP is only for private land, while NM's includes public land (primarily BLM). Our Critical Habitat Management Portal has a LPC Leaderboard on the LPC page that keeps track of acreage/money enrolled for LPC conservation. You can also find descriptions of, and links to all the aforementioned programs if you choose NM from LPC page. Hope that helped. How long has the RWP existed? It sure seems like a lot of acres and money enrolled in a short time. What about the New Mexico CCA/CCAA that has been on the ground since 2008, how much money and conservation has that program contributed? Correct if I am wrong, but the RWP can only enroll private lands and the New Mexico CCA/CCAA can enroll federal, State and private lands.